A fire at the University of Wisconsin-Whitewater's Sigma Sigma Sigma (Tri Sigma) Sorority House, was reported at approximately 10:44 this morning, March 21, 2014. One of the sorority sisters was transported to the hospital for smoke inhalation. All 23 occupants were displaced because of heavy smoke and water damage. When it was initially reported, the fire was small, but by the time the fire department arrived, it had grown considerably. The fire occurred on the first floor of the house and fire damage was limited to a single room. The cause of the fire is currently listed as undetermined. Whitewater firefighters were assisted by fire and EMS personnel from Elkhorn, Fort Atkinson La Grange, Janesville, Jefferson, Walworth County Sheriff's Department, Whitewater Police Department, and the Walworth County Arson Task Force. The University of Wisconsin-Whitewater Web site lists Tri Sigma as an official, university sanctioned Greek organization.Wisconsin fire code dictates that all buildings that are used by university sanctioned fraternities and sororities, if built before January 7, 2006, were required to have sprinkler systems installed by January 1, 2014. The property owners were in the process of installing fire sprinklers in the house--nearly three months after the deadline--however the incompletesystem was not operational at the time of the fire. To learn more about the Center for Campus Fire Safety and its programs, visit www.campusfiresafety.org. Ithaca, N.Y. -- A late night fire on Eddy Street in Ithaca gutted a three-story house and left 12 Cornell students without a home. 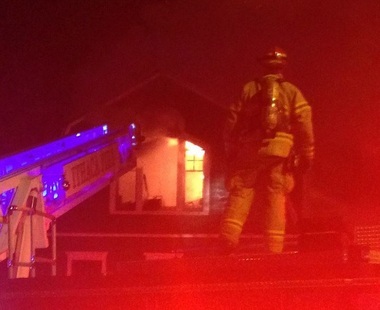 No one was injured in the fire, the Ithaca Fire Department reports. When firefighters arrived at 202 Eddy St. around 1 a.m. Friday morning, they saw flames coming up through the roof, the fire department said. The department said that investigators had not yet determined the cause of the fire. The Ithaca Journal reports that two of the 12 student-residents were home when the blaze started. By the time firefighters arrived to heavy smoke and flames coming from the top floor of the building, the students had safely escaped, the Journal reported. Firefighters were able to put out the flames within two hours. The university is assisting the displaced students with finding new housing, the Journal reported. A fire broke out in Building G of the Scott Village Apartment Complex on the University of Nebraska at Omaha Pacific Campus around 3:12PM, Wednesday afternoon. Nearly fifty of the building's residents were displaced as a result of the fire. Careless disposal of smoking materials is currently listed as the cause of the fire. Nearly fifty Omaha Fire Department personnel worked to stop the blaze. Their efforts were hampered by strong winds. While no students have been reported to be injured and all are accounted for, one firefighter was injured during the fire, and was treated at a nearby hospital for a leg injury. Campus officials are working with internal and external partners to find alternate housing for the forty eight displaced students. The University's Web site states that smoking is not permitted within the Scott Village Apartment Complex. Their Web site further states that all on-campus residence halls have building fire alarms and sprinkler systems. We will issue further information when it becomes available. The Center for Campus Fire Safety (CCFS) has been documenting specific campus -elated fires deaths since Year 2000. Current and more detailed statistics, along with the definition of how we define "campus-related fires" are always posted on the Web site, along with a host of fire safety resources and tips for fire safety professionals as well as students in both universities and off-campus housing. One of the resources includes a daily and ongoing listing of other fire incidents in the higher education arena. To learn more about CCFS and its programs, visit www.campusfiresafety.org.